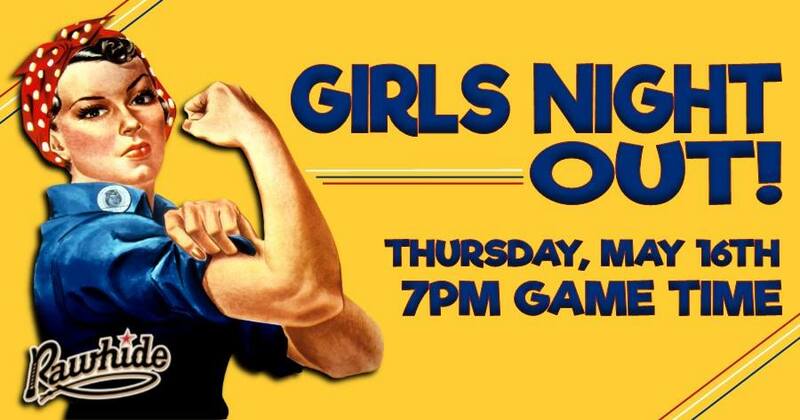 SAVE THE DATE for our annual Girl's Night Out promotion at the ballpark on May 16th. First pitch is at 7PM. Once again, the ballpark will be jam-packed with booths that will cater to the ladies! Visit all of the booths to get your passport stamped and you'll be entered to win over 50 prizes! If you are interested in having a vendor booth for this event, please e-mail Jill@RawhideBaseball.com. Make sure you bring your friend and let's have another successful Girl's Night Out at the Ballpark! Stay tuned in this Event Page as there are more details to come and they'll be posted here. SAVE THE DATE for our annual Girl's Night Out promotion at the ballpark on May 16th. First pitch is at 7PM. Once again, the ballpark will be jam-packed with booths that will cater to the ladies! Visit all of the booths to get your passport stamped and you'll be entered to win over 50 prizes! If you are interested in having a vendor booth for this event, please e-mail Jill@RawhideBaseball.com. Make sure you bring your friend and let's have another successful Girl's Night Out at the Ballpark! Stay tuned in this Event Page as there are more details to come and they'll be posted here.